Th e turf research facility located at the Lewis Brown Farm has become a showcase for the OSU Turf Program as numerous research trials are conducted annually, an annual turf field day is held every fall, and tours are provided to various interest groups. Since Tom Cooks retirement from OSU considerable time and money have been invested into the upgrading of the turfgrass research facility and equipment. Upgrades of the turf farm have included the removal of 20+ trees, the construction of a 12,000 sq.ft. modified USGA specification annual bluegrass putting green, renovation of 5,000 sq.ft. creeping bentgrass green, renovation of a 3,000 sq.ft. 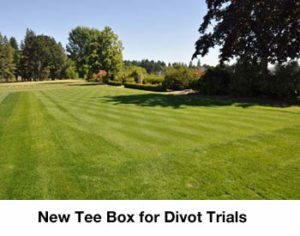 perennial ryegrass tee box, and the construction of a new 4,000 sq.ft. native soil based annual bluegrass putting green. Equipment purchases have included a used Toro Sidewinder, John-Deere Aercore, two EZ-Go utility carts, two rotary striping mowers, and a new topdressing drag brush. Equipment donations also received for use during the year include a Toro Workman, Tru-Turf Roller, and a Ryan Sod-Cutter and Slit-Seeder. Along side Turf Specialist Alec Kowalewski the 2nd permanent member of the OSU turf program includes Senior Faculty Research Assistant Brian McDonald. Brian has been with the turf program for over 15 years serving as the research technician and turf farm manager. His primary responsibilities are to design, conduct, and evaluate research trials along with overseeing the day to day operations of the turf facility. Much of the funding needed to sustain the program comes from the research trials conducted by Brian. In addition, Brian does an excellent job training and preparing students to be successful upon graduation from OSU. 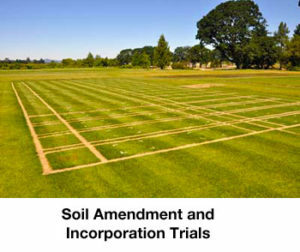 Over this past year over 20 different research trials were initiated that generated timely information to assist turfgrass managers not only here in the Pacific Northwest, but across the country. 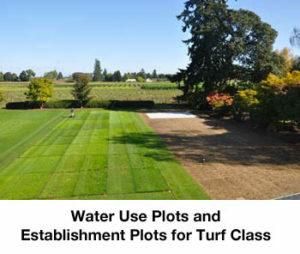 Studies have included annual bluegrass management strategies, weed and disease control trials, plant growth regulator and fertility evaluations, and turfgrass varietal trials. 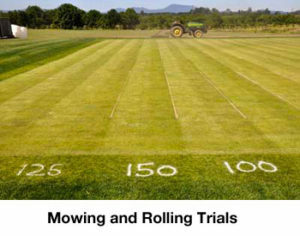 The mowing and rolling research has garnered national attention with several trade journals publishing information about the research findings. In 2015, with the help of four Graduate Assistants; Clint Mattox, Brian Daviscourt, Micah Gould, and Conner Olsen this team provided 40 Extension teaching events, 19 site visits, 21 proceedings, 5 scientific abstracts, 4 presentations to peers within the scientific community, 7 industry publications, 4 press releases, and 3 peer review journal publications. Below are the current graduate assistants and their research and objectives. Prove the efficacy of utilizing reclaimed wastewater for irrigation of rough-length perennial ryegrass, both through the assessment of salt-tolerant cultivars, as well as through seasonal soil and tissue sampling. Findings: Data collection is currently in progress, however, initial estimates are that salt accumulation may not be a problem for grasses in the Willamette Valley, where annual precipitation could provide sufficient leaching. It has yet to be determined if there is a difference between year-round (i.e. wastewater disposal sites) and supplemental irrigation applications (i.e. summer irrigation of golf courses). It is also thought that through optimizing the watering schedule in terms of application frequency and intensity, acceptable turf quality could be achieved with less water than the current recommendation of 1″/week. Explore techniques of controlling Microdochium patch in the absence of fungicides on annual bluegrass putting greens and to further explore modes of action of these techniques. Findings: 2013-2015 field trials have provided promising results regarding alternative methods of controlling Microdochium patch on annual bluegrass putting greens. Current focus is on refining techniques to provide a comprehensive IPM protocol for the management of Microdochium patch in the absence of fungicides. Further studies focus on exploring the modes of actions of these new management techniques. Create and compare the maintenance budgets of 5 natural grass and 5 synthetic fields for a 20 year period. Gather field-use hours and calculate the cost of providind an individual with an hour of use in regaurds to the 20-year life cycle analysis. Findings: The results 20-year life cycle analysis revealed that synthetic fields were almost twice as expensive as natural grass fields. However the cost of providing and individual with an hour of use were not significantly different. The number of hours put on the synthetic fields was enough to balance the large expense of installing, maintaining, and re-carpeting a synthetic field over a 20 year period. Identify ground covers that can compete with weeds while maintaining aesthetic qualities with minimal maintenance. Findings: Agrostis capillaris L. (Colonial bentgrass), Festuca rubra L. spp. ‘Commutate’ (Chewings fescue), and Festuca rubra L. spp. ‘Rubra Gaudin’ (Strong creeping red fescue) had the highest plant cover (83%, 76%, and 74% respectively), followed by Sedum spurium ‘Dragon’s blood tricolor’ which provided 51.8% ground cover. A strong inverse correlation between plant ground cover and weed ground cover was identified. Mowing did not affect percent plant or weed ground cover. 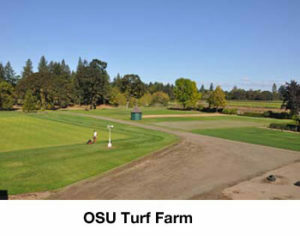 Lastly, the Oregon Turfgrass Foundation is the driving force behind an effort to provide OSU with funding for The Senior Faculty Research Assistant Position. Each year the OTF donates $50,000.00 to OSU Foundation to assistant in the funding for this. This is significant because it will allow OSU to continue its endeavor to be one of the elite turfgrass programs in the United States. Tickets for 2019 Bandon Dunes Raffle on Sale now! Package includes: Two Nights Lily Pond Lodging for Four (double occupancy) and Eight Rounds of Golf at Bandon Dunes Golf Resort (Subject to availability) Valid through December 31, 2019. Package valued at $3,560.